Several years ago, Morgen and I visited Venice, that beautiful Italian city where the streets are paved with water. We were there for only a few days, but we enjoyed every minute of it. The place oozes history, and it’s wonderfully romantic. 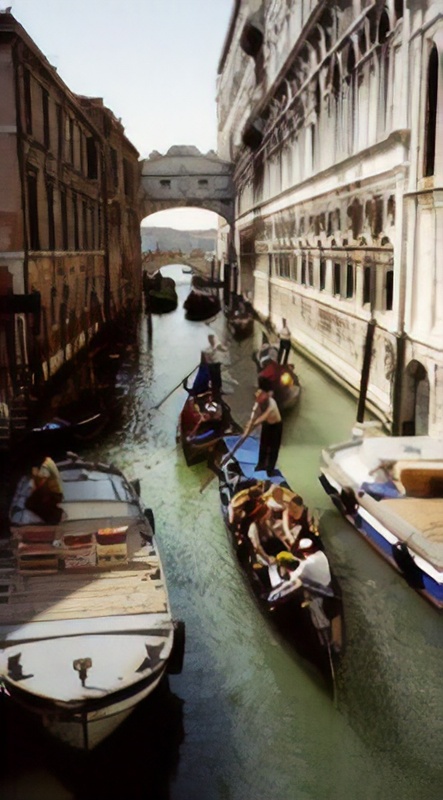 When we took the customary gondola ride through the city’s canals, our gondolier casually pointed toward a small house and said, “Marco Polo used to live there.” And we could believe it—if it were not for the constant noise of motor boats, it would be easy to imagine that the city looked much the same way centuries ago as it does now. But it’s not quite the same as it was in Marco Polo’s time. Whatever other changes have happened, the most significant one is that the city, as our gondolier reminded us, is sinking. Of course, the entire planet is doomed to be destroyed when the sun explodes in 500 million years or so, but I’m not losing any sleep over that. Why should I worry about Venice? It still looks OK to me, so it must be sinking very slowly, right? Well, not really. Venice is located in a lagoon on the edge of the Adriatic Sea. When Venice was founded in the year 421, the level of the Adriatic was about 5 meters (16 feet) lower than it is today. For centuries the water level rose very, very slowly, but in the last century or so the rate has increased dramatically. With each passing year, the difference between street level and water level shrinks faster. From time to time, the city gets a brief reprieve. On more than one occasion in early 2005, unusual weather patterns caused Venice to experience exceptionally low tides—so low that boats could not navigate most of the city’s shallower canals. Nevertheless, the clear trend, as observed over centuries, is in a decisively downward direction. If nothing is done and the trend continues, by 2055, a significant portion of the city’s walkways, plazas, and ground-level floors will be submerged all the time. For a long time I was puzzled about just what it meant for Venice to be “sinking,” because that doesn’t fit into my categories of things a city is capable of doing. This is in fact a somewhat simplistic description of a complex problem. One part of the problem is that the city is not built on a solid foundation. Venice was originally a collection of muddy islands. In order to construct buildings, workers drove millions of pilings—thin, sharpened poles made of alder trees—through the mud and into the marginally more solid base of sand and clay beneath. Oak planks were placed on top of the pilings, and on top of the planks, several thick layers of marble (which is impermeable by water) formed the foundations of the buildings. From there on up, most of the construction was done in ordinary brick or wood. At the time the buildings were constructed, the marble was well above the high water line, so there was nothing to worry about. However, over the centuries, the weight of the buildings has driven the pilings deeper into the mushy seabed. In addition, at one time there were hundreds of wells in the city, removing water from deep aquifers. Unfortunately, these aquifers had acted as a sort of balloon of water propping up the city; when it was “deflated,” the city began to sink even faster. But the literal sinking of Venice, which averages something like a few centimeters per century, is only part of the problem. The other part is that the surrounding water level has been rising at an alarming rate. This is partly due to the effects of global warming and partly due to centuries of poor environmental management in the entire region. But in any case, the rising waters compound the sinking problem and make the net effect quite serious. Venice has always been subject to periodic flooding—mainly in winter, and especially at high tide. This is something that residents have come to regard as a fact of life, and not a terribly troublesome one; most of them get around in boats anyway. But whereas flooding used to be something that would happen a few times a year, now it happens on the order of a hundred times a year. Because the sea level has risen, even in a modest flood, the water level rises above the waterproof marble foundations of the buildings, rapidly wearing away the less-robust building materials. In November, 1966, a particularly bad storm caused a devastating flood that put much of the city under 2 meters (over 6 feet) of water. This caused extensive damage to both buildings and the valuable artwork they contained, and began to impress upon Venetians the need to take drastic action. In 1970, a plan was proposed that involved the installation of large, mobile gates at the three inlets of the lagoon; these would be raised as needed to keep out high water. But for the next 30 years, a series of excruciating delays prevented any significant progress from being made. There were, of course, significant engineering problems to be solved, not to mention the problem of financing such an ambitious undertaking. But political reasons, more than anything else, held up development. Many Venetians did not want to believe their city was in imminent danger—and even to the extent that they did, there was tremendous disagreement about how best to address the problem. Some wanted to address the problem at the base—to basically “jack up” the city and install new and improved foundations. Others wanted to build a series of dikes and locks around the city—the so-called “Dutch solution”—or use a different mechanism to hold back high waters. At the end of 2001, a plan was finally put in motion to keep back the high waters. Nicknamed “Project Moses,” the plan calls for the construction of 79 steel gates, hinged at the bottom, to be installed along the sea floor at the three inlets to the lagoon. The gates, which are hollow and normally filled with water, measure 20 meters wide, 3.6 meters deep, and 20 to 30 meters high. When water levels appear to be rising dangerously high, compressed air will be pumped into the gates, causing the ends to float up to (and slightly above) the surface. In effect, they will form a dynamic dam that will appear only when needed. The gates will be tall enough to hold back water quite a bit deeper than the 1966 flood. Although construction has begun, there are still numerous problems ahead. One problem is where the 3 billion euro (about US$3.5 billion) budget will come from; the government does not currently have adequate reserves to pay for the project. There are also significant environmental concerns; the project was vigorously opposed by numerous environmental groups. Among the concerns is that any interference with normal tides will increase the levels of toxic chemicals such as mercury in the waters of Venice, seriously threatening both marine life and the health of people who consume the local fish. There are also basic worries about health and sanitation. Venice has no sewer system; household waste flows into the canals and is washed out into the ocean twice a day with the tides. No one is certain quite what effect the gates will have on the city’s natural waste treatment system. Under the most optimistic prediction, Project Moses will be operational by 2009, but given the city’s history of delays, few expect it to be finished that soon. And even if it works perfectly, it is not a complete or final solution. The city will continue to sink and the water level will continue to rise. Sooner or later, the gates will no longer be able to protect the city from deterioration. An outstanding book about Venice’s struggle for survival, published in 2002, is Venice Against the Sea: A City Beseiged by John Keahey. It covers the entire history of the city and the technological, political, and environmental issues involved in saving it. There’s also an earlier book that’s still worthwhile: The Death of Venice by Stephen Fay and Phillip Knightley, published in 1976. For more information about Venice’s struggle to stay above water, see articles in Scientific American, NOVA, The Detroit Free Press, or Climate Ark. The unusually low tides in early 2005 were reported on sites such as Veniceblog (first post | second post) and News24.com.